The man in the title is me. Way back when I was a young, easily pleased SF fan, I encountered a book by a favourite author, a book that taught me a very valuable lesson: I don’t have to finish every book I begin . The year was 1980; the book was Robert A. Heinlein’s Number of the Beast . I could have possibly have learned this lesson a few years earlier, in 1978, when I first read Poul Anderson’s The Avatar. This book is the “distilled essence of Bad Poul Anderson fiction of the 1970s” (to quote myself). But the book does have its strong points, which may be the reason why it was Number of the Beast and not The Avatar that taught me not to waste my time doggedly finishing tripe. The discovery of a mysterious but impressive alien artifact—inserted into Earth’s orbit but 180 degrees removed, thus forever hidden behind the sun—triggered the Troubles, that terrible time when things went kerblewie. Humans did not react well to the idea that they shared the universe with vastly more advanced entities. Military governments brought Canada and the sensible parts of the US under control. The other regions of the world accreted into new nations and then everyone united in a World Union. But the world of this novel isn’t all existential despair and off-handed dismissal of responsible government. The alien artifact turns out to be a portal to new worlds. A few years before the novel opens, an alien space craft transited through the Phoebus system, following a T machine path unfamiliar to humans. The starship Emissary set out on that path, hoping to make contact with this new and unfamiliar race of aliens. If everything went according to plan, Emissary would not return for nearly a decade. If things don’t go according to plan … it’s possible nobody will ever see Emissary and its crew again. Emissary succeeds in making contact with the alien Betans, and finds them quite friendly. They have a thousand years more experience with the T machines than the humans do. They have explored more than a hundred stellar systems and contacted twenty or so other intelligent races. The Betans think the humans, backwards as they are, may be useful as sources of information and trade partners. They send an envoy back to the human realm on Emissary. The Betans have also mastered an inherent capability of the T machine humans had suspected should be possible, but had not been able to use: the artifacts allow spaceships to traverse not only distance, but time. Emissary returns to the Phoebus System a mere five months after it left. This new technology could be useful in many ways; it could also destabilize human society yet again. Ira Quick, the (well-meaning/power-mad) Minister for Research and Development, decides that these new developments must be suppressed. He puts Emissary under quarantine, sequestered somewhere in the Asteroid Belt. Ira is a clear-eyed realist who doesn’t take all that many steps to get from “I don’t want to find any more dead girls in the wreckage of their war-zone homes” to “all destabilizing factors must be identified and either controlled or ha ha ha eliminated.” The crew of the Emissary is a destabilizing factor to be eliminated. It’s very lucky for them that their brief appearance in the Phoebus system was noted by a robot probe belonging to businessman Daniel Broderson. Daniel starts asking questions about Emissary and is placed under house arrest. He’s rich; he has connections and resources; he manages to escape and head out, on his personal spaceship, on a mission to rescue Emissary. He is accompanied by his lover Caitlin; his wife Lis gets to stay home to deal with the government. The rescue starts to go pear shaped once the good ship Chinook reaches the quarantined Emissary. Daniel and his crew manage to rescue some but not all of the crew of Emissary (as well as the Betan envoy), but there are fatalities. Worse yet, Daniel tries and fails to prevent the quarantine station from alerting Quick. Quick dispatches an armed ship after Chinook. Chinook heads for the Solar System T machine, hoping to reach Phoebus. That trajectory is known, and blocked. The rescue ship narrowly avoids destruction by taking an unexpected path. The good news is that the Chinook and her crew survive. The bad news is the system they ended up in is unfamiliar to both humans and Betans; nobody knows the way home. Chinook has two options: stay put and hope for eventual rescue before supplies run out (not terribly likely, given that the only ship that knows the path they took was trying to kill them) or use the T machine in this system to explore the network in hopes of finding a way back to some known and safe place. It’s not impossible that Chinook will find its way home. However, the odds are low. The Betans have been brute-force mapping the T machine network with cheap probes for a thousand years, A billion probes later, they have only mapped a hundred systems. Things do not look promising for our intrepid adventurers. I wondered why the Betans complicated a first contact situation with time travel but now I think it might have been a test, to see what sort of trading partners humans would make. Worldbuilding nitpick: this is yet another book where fusion-powered rockets can zoom around at one gee pretty much forever and the quarantine station is close enough that people can commute from Earth. Am I the only one who has read Pournelle’s essay “Those Pesky Belters and Their Torchships”? Well, at least this isn’t one of those “all spaceships have fusion drives producing a Pickering A amount of power from a power plant the size of a Volkswagen, but Earth is starved for energy” settings. Specifically, it was Patrick L. McGuire’s “Her Strong Enchantments Failing” that drew my eye to certain stylistic and plotting quirks of Anderson’s, quirks that once I was aware of them, I simply couldn’t ignore. 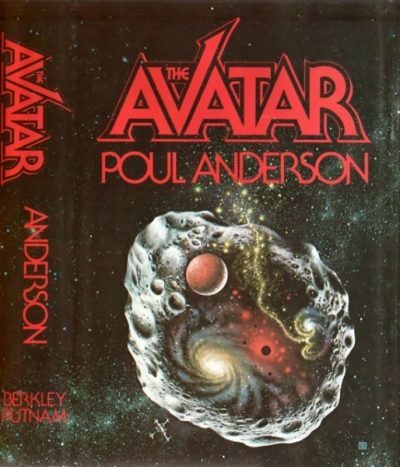 Judging by the release dates, I had to have purchased The Book of Poul Anderson and The Avatar almost back to back. Anderson did have distinctive stylistic quirks; see this essay by Carlos Yu for a comprehensive discussion. For some reason Anderson indulged them to a greater degree in this book than he did in his other novels (as the owner of seventy or eighty of his books, I should know). Readers who enjoy those quirks should enjoy The Avatar. Readers for whom Anderson’s style was the price paid for the adventure and worldbuilding will probably be disappointed. Anderson struggles with how to convey background information to the reader, perhaps because he tends to have more to convey than other, less creative authors. Sometimes he just has an omniscient narrator ramble on for a bit and sometimes, as in the entirety of chapter eight, he has characters contrive a reason to review an old historical piece for their own edification. The fiends! Next thing you know, the World Council will be embracing the philosophies of Paul Krugman! Contrary to the views of some folks, I think it’s pretty much impossible to write an entirely apolitical book if it has human characters. Now it is true that sometimes the politics intrinsic in the setting are in no way the author’s personal politics. How many writers hope some kid manages to unify the nation by pulling a magical sword out of a stone? Or hope for a chemical process that will let them access racial memory? But authors do imagine their worlds, characters, and plots with reference to some set of political assumptions. Such assumptions can be so implicit as to be nigh invisible. That’s the light touch. By this point in his career, Anderson had pretty much lost any light touch he might have had. As a reader, I experience this as something like having large crescent-shaped rocks dropped on my head while the author shouts “UNORTHODOX ECONOMIC REVENGE!” To be scrupulously fair, I should add that Anderson isn’t Randian; he has some sympathy for the poor, even if he’s absolutely determined to keep the government from doing anything constructive to help them. Anderson does try to make Ira Quick something more than a cardboard villain, (although Quick falls sadly short of Anderson’s greatest antagonist, Aycharaych). The author gives Quick the same justification that various wrong-headed antagonists have used in other Anderson books; unregulated change brings chaos which means little girls dying in war zones. (I find it interesting that the Anderson hero, Dominic Flandry would also cite that concern as he ranged the Empire, stomping on its enemies.) That said, Quick’s allies range from the pathetic to the cartoonishly villainous; Anderson wasn’t so careful with them. Anderson seems to have been suffering from plot fatigue when he was writing the conclusion of the book. Ira Quick, faced with Chinook’s return, folds like a wet paper bag. Given that Chinook is accompanied by a flotilla of alien ships, any decent politician could have spun that into Daniel selling out humanity to the aliens. There’s also the matter of Daniel’s love life; he has faithful Lis waiting for him at home and easy-going Caitlin for the road trips. While Daniel isn’t the sort of cad who’d deny his wife the same freedoms he has, it just so happens she chooses of her own free will (to the extent that characters in books have free will) not to make use of that freedom. The result is an arrangement that looks almost like the fantasies of a middle-aged male writer . The fact that Caitlin is the sort of character to be a wish fulfillment fantasy doesn’t help. Speaking as former regular at Usenet’s alt.poly, I applaud Anderson’s acceptance of relationships that were highly unconventional in the 1970s. It would be even better if I didn’t find his depiction of the relationships involved as grating as fingernails down a blackboard . Worldbuilding mattered a lot more to Anderson than it did, or does, to most of his fellow SF authors. This book is readable just for the careful worldbuilding . Once Chinook starts exploring the T machine network, Anderson starts to show his best stuff. The ship visits multiple systems, no two of which are alike. There are Earth-like worlds old enough that world-death looms; there are systems so young that worlds have not coalesced. The ship traverses history: from the very early stelliferous to an era when the suns are dead. It observes exotic but inhabited worlds that range from gas giants to neutron stars. Anderson puts some effort into creating a believable world for each and every one of these visits. He puts more effort into each world than many authors put out for stories set on just one world. He creates and then abandons settings after just one book; other authors would have spun a whole series from their feeble worldbuilding. The variety was wonderful, intoxicating, although ultimately an overload. At some point in the second half of the book I began to suffer new world fatigue. Even so, that’s a hell of a lot more interesting than a sequence of unmemorable single-biome worlds. I am a sucker for stories about exploring portal networks. On rereading this book, I had an epiphany. Why would Elder Races find it worthwhile to supply portals to less technologically advanced races? Because races dependent on the portal network can only go to the places that are part of the network. An Elder Race can keep the Kids Off Their Lawn simply by making sure that convenient portal network doesn’t go anywhere near Their Lawn. If I recall correctly, this novel wasn’t well received at the time, although I haven’t been able to track down the old reviews to double-check. I do remember finding it off-putting in ways I could not articulate when I first read it. It’s not surprising that The Avatar has been out of print (in paper) since the early 1980s. 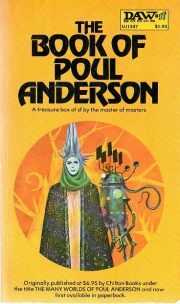 However, it is one of a number of Poul Anderson titles recently republished in e-format by Open Road Integrated Media. I certainly didn’t like this book, but someone else might. If you want to give this one a try, a new copy can be purchased here. 1: Unless someone pays me, of course. 2: Once again, there’s a special offer for anyone who wants me to reread Number and that special offer is that the review will cost a thousand bucks. I really really really don’t want to read that @#$@#!$@!# a third and a half time. 3: Almost but not quite, because Lis affectionately needles Daniel for lying by omission about an assignation with Caitlin. 4: In theory the relationships are fine. It’s how he handles them that’s the problem. At least one of the people reading this may feel the need to pop in with speculations about what real person Caitlin might be based on. On one hand, the fact that a figure so clearly pandering to a certain sort of fantasy might be based on someone real is interesting but on the other SHUT UP SHUT UP SHUT UP I ALREADY KNOW WAY TOO MUCH ABOUT SF AUTHORS OF THE BAY AREA AND AM RUNNING OUT OF BRAIN BLEACH SHUT UP SHUT UP SHUT UP! 5: Caveat: early in the book there are details that don’t bear close examination. For example, the T machines are made from neutronium, which has a density of very roughly 10^17 kilograms per M^3. Each cylinder is two kilometers in diameter and a thousand kilometers long. Each cylinder should therefore mass around pi × 10^29 kg. Anderson says the T machines have the same mass as the moon, but if they existed as described, they would be couple of orders of magnitude more massive than Jupiter’s 1.9 × 10^27 kg. If that is so, then we have to wonder, not only how does the T machine hide the perturbations its mass would cause in the Earth’s orbit, but rather how is it that Venus and Mercury have not been flung out of their orbits by repeated close encounters with an object the mass of a small star? Another caveat: Anderson deals with the fact that small amounts of neutronium are not stable by explaining that a wizard did it the mysterious Others have ways of making neutronium stable. Yet another caveat: the demographics of Demeter do not work. Demeter has been settled for perhaps seventy years. Only a thousand or so people emigrate per year. However, the population of Eopolis is half a million and it isn’t the only center of population. Please explain.